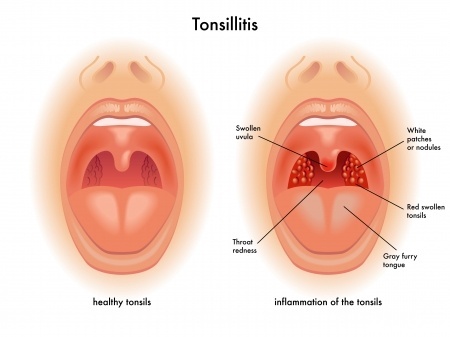 Acute Tonsillitis: This is a bacterial or viral infection in the tonsils and it usually heals up with treatment and there are no further issues. Chronic Tonsillitis: Tonsillitis becomes chronic when episodes of acute tonsillitis reoccur repeatedly. Recurrent tonsillitis can have young children and teens see the doctor often. Many children require surgery to remove the tonsils. Read on to learn more about chronic tonsillitis. Symptoms of acute tonsillitis include: throat pain, throat swelling, white or yellow discharge, blisters or ulcers, headache, loss of voice, reduced appetite, pain in the ears, troubleswallowing, fever, swollen glands, nausea, abdominal pain, vomiting and bad breath. The infection becomes chronic when the symptoms do not go away with time, rest and treatment. If tonsillitis continues over long periods of time the inflammation in the throat can cause patients to have trouble breathing. This can lead to trouble breathing at night during sleep, otherwise known as, sleep apnea. If the original infection is not completely healed it can spread deep into the tissues and cause cellulitis. This can also lead to fluid build-up behind the tonsils causing an abscess. Untreated Strep infections can be serious and lead to rheumatic fever that can infect the heart, other organs and joints. Strep can also cause glomerulonephritis that weakens the kidneys ability to remove waste from the body. The viral causes need to clear up on their own with rest and fluids and the bacterial causes require antibiotic treatment. This refers to environmental allergies that cause drainage down the back of the throat or a food allergy. Some of the foods that cause tonsillitis are bananas, citrus, milk products, and preservatives used in foods. When the weather gets cold, people are indoors more and closer together. This can spread the germs that cause tonsillitis. Changes in weather or damp areas can breed bacteria and viruses. Cold weather can also stress the immune system and lower the body’s ability to fight off infection. Some studies have shown there may be a slight genetic link to chronic tonsillitis. It has been shown to run in families possibly due to tonsil structure and predisposition to post-nasal drip and/or allergies. Lack of tooth brushing and gargling to clear the mouth and tonsils of bacteria could lead to infections. Smoking causes inflammation to the delicate tissues on the back of the throat. It can also weaken the immune system and keep your body from absorbing necessary vitamins and minerals that help you fight off infection. The bacteria and viruses that cause chronic sinusitis can linger in the tonsils and cause them to become infected. Treat infections in the sinuses promptly to avoid them spreading to the throat area. Bacterial – If the strep test is positive or the doctor has enough reason to believe your infection is bacterial, you will be given a prescription for antibiotics. Symptoms may go away quickly, but you need to take the entire prescription to completely clear the bacteria. Virus – If the strep test is negative and the doctor believes the cause is viral, antibiotics will not help. Viral infections usually go away on their own with time, rest and taking good care ofyourself. Believe it or not, your tonsils have an important job! They are a vital part of your immune system. There are a lot of doctors that do not remove tonsils under any circumstance, but if the tonsils become so enlarged that they obstruct breathing then tonsillectomy may be necessary. They may also suggest removal if chronic tonsillitis is severe. The surgery is known as a tonsillectomy. The surgeon will remove the tonsils with either a regular scalpel or use a laser to burn off the tonsils. It is usually an in-and-out procedure with minimal recovery time. There are complications and you should discuss this with your doctor.